Believe it or not Daylight Saving Time started 3 weeks ago, and Easter is just 2 weeks from this coming Sunday! 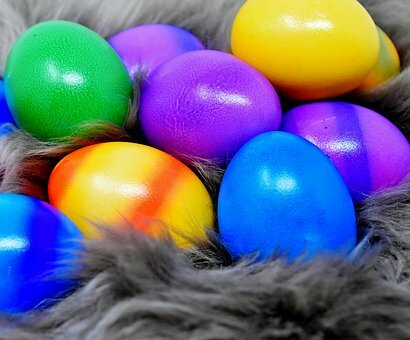 The ever-popular Carlsbad EGGStravaganza Spring Festival takes place the day BEFORE Easter, Saturday April 20, in one of Carlsbad’s nicest parks, Poinsettia Park at 6600 Hidden Valley Road, from 10 am until 1pm. Carlsbad EGGStravaganza offers lots of fun, although mostly for the younger generation, with cookie decorating, face painting, “Soak the Bunny,” a variety of crafts, and a fun zone. Kids can enjoy Carlsbad’s largest Egg Hunt (Activity Cards are required) from 10:30 until 12:30, with 2 competitive fields, for ages 6 and older, and 5 and under. Groups of 20 – 30 children at a time will hunt for candy-filled eggs until they are gone, then the fields will be readied for the next group. EGGStravaganza will also offer a non-competitive field for younger children, those with special needs, and for families to take their photos. Unlimited Fun Zone Wristbands ($5) and Activity Cards ($5) must be purchased in person at one of the following locations during normal business hours. There are NO online or phone registrations, and no refunds or replacements if wristbands or activity cards are lost or you forget to bring them. You can also purchase Wristbands and Activity Cards at the event. Food and beverages will be available for purchase, too.